In general, accounting can be a challenge for any business. Payroll, assets, and reporting can be a pain. And for nonprofits, accounting is even more of a bear because of the differences in profit vs nonprofit accounting and the constantly changing guidelines. 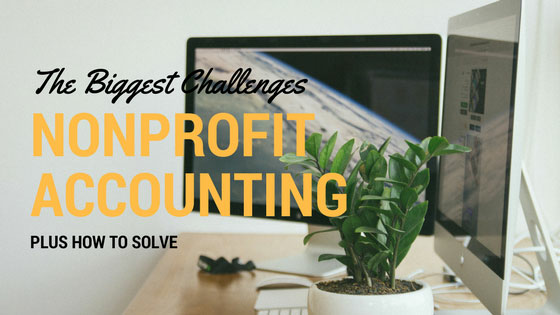 Below we talk about 3 of the biggest challenges in nonprofit accounting and how you can help solve them in your organization. Grant tracking can be particularly difficult for nonprofits. If there isn’t clear communication with grantors or you aren’t keeping track of the grants you have, this can end up an overwhelming mess. A good way to help track grants is to include them in your fund accounting software. Many platforms have a module specifically for grants, which makes it easier to track and report. Another solution is to hire someone to manage your grant programs. A dedicated grant person would ensure you’re following all guidelines, apply for new grants (which is a time consuming process), and report on how well the grant is doing. Cybersecurity is a HUGE concern – and with more attacks happening, it’s important for nonprofits to make security a top priority. Limit who has access to your accounting platform – and don’t let users share logins! If you have an IT department, make sure they are regularly monitoring your website and accounting platform for suspicious activity. The Financial Accounting Standards Board sets the generally accepted accounting principles in the United States. While it’s good that to have these guidelines, it can be tricky when the guidelines and compliance rules change. Not following the FASB, even accidentally, can be costly for nonprofits. One way nonprofits can stay on top of the ever-changing FASB compliance rules is to use a fund accounting software that automatically keeps your financials up-to-date with the guidelines. Platforms like Abila offer this as a module – and is well worth the investment.